Current events for this round come from Unit 2 or Unit 3, and must include a copy of the relevant Georgia Performance Standard. Remember that to post your article, you need to click the [New post] button below and not [Edit Page]. February 10, 2011 - This year the world will be welcoming the new republic of South Sudan. The votes are in and it is official, the people of southern Sudan has voted to separate and form a new country. They have declared independence and the new country will be born on July 9, 2011. The people voted from the 9th to the 15th of January and the votes were counted and verified on January 30. 98.83% of the people that participated in this historical referendum voted for the separation of Southern Sudan. There are still obstacles in the separation like the sharing the oil reserves, 80% of which now belong to Southern Sudan. The president of Sudan has officially agreed to the separation and will not prevent its independence. Folks, it looks as if we will have to re-draw our maps. However it is a great thing that the people have found a way to solve their issues. We expect the cultural tension in this region to decrease as they have finally settled it by separating and forming a new country in which we hope will start off in a great way. ParkerPedia would like to wish the people of Southern Sudan good luck in their separation and hope that everything runs smoothly. After 18 long days of revolting President Mubarak of Egypt has steeped down. As we speak there are crowds of Egyptians jumping with joy to hear that there "Leader" has left. On what we thought was just a vacation for Mubarak turned into the beginning of a new change for Egypt. Thursday November 25, 2010 ― The South Korean Presidency has confirmed that the South Korean Defense Minister does no longer hold the position after resigned Thursday due to a high volume of criticism. Many South Korean lawmakers believe that South Korea should have deployed their fighter jets to respond to N. Korea's attack. A spokesman from the Presidential Blue House stated that the Defense Minister had submitted his resignation in May when N. Korea torpedoed a South Korean boat. The Presidential Blue House turned his first resignation down but now with the heavy criticism they didn't have any other choice to accept the resignation. The P. Blue House said that a new Defense Minister will be appointed soon. Thursday November 25, 2010 ― North Korean media said that the military has been ordered to attack if provoked again by the South Korean military. 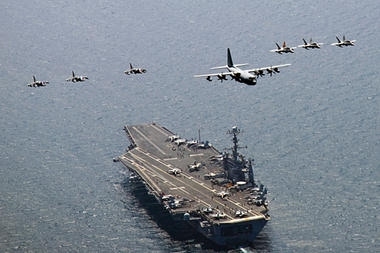 The N. Korean military said that they will not tolerate any provocations from the routine exercises being conducted by the S. Korean and the United States military at the Yellow Seas. South Korean responded by enforcing its exercises and alerting the five marine bases near North Korea. A stronger military drill will be conducted by the joint forces of the South Korean military and the United States military. This drill will be starting Sunday and it will take place at the Yellow Seas. The aircraft carrier USS George Washington is steaming at full speed towards the Yellow Seas to be part of this planned exercise drill. Many economic experts will be monitoring the markets to see if this conflict will affect the stock market. The South Korean government will be implanting any necessary measures so that the stock market is too affect. ParkerPedia will continue to update any important news in this arising conflict. USS George Washington steaming towards the Yellow Seas. Tuesday November 23, 2010 ― It all began when South Korea started its military routine exercises by firing artillery shots within its territorial waters when suddenly North Korea fires 100 rounds of artillery at Yeonpyeong Island in the Yellow Sea. North Korea said that South Korea was engaged in "reckless military provocation" and that they wouldn't tolerate any provocation from them. The attack against South Korea has currently caused two deaths, several casualties, and the evacuation of the Yeonpyeong Island. After N. Korea's attack towards S. Korea, South Korea's military responded by firing about more than 80 rounds of artillery and deploying several fighter jets; the confrontation lasted for about an hour and then later stopped. After firing ceased, South Korean leader stated that the foreign aid being given to N. Korea will stop and also said that the S. Korean government "banned its nationals from entering the communist state, indefinitely postponed scheduled Red Cross talks and began looking at ways to push the United Nations to condemn Pyongyang. President Barack Obama defended South Korea in this conflict and that he will not give his opinion on the matter until he consults with the South Korean President. However he has stated that both presidents have agreed to have both (South Korean and United States) military in combined exercises to prepare for any further arising conflict. Many officials say that North Korea was trying to distract the world from a recent discovery from a scientist stating that N. Korea has built a new uranium enrichment facility and that they plan to enhance their nuclear program. Several meetings will be taking place to discuss the actions of North Korea and to discuss to whether there should be any consequences towards North Korea. ParkerPedia will be on the topic reporting any important news from this arising conflict between the Koreas. Israel is working on stopping immigrants that are seeking work. Israel's prime minister has announced that the immigration is getting out of hand since they are stealing their jobs. They have made a detention center to put immigrants in to stop them from taking their jobs for the immigrants that enter the country illegally but yet cannot be deported. Pakistan has denied the U.S's request to access more air space for U.S drones. Drones are planes were there is no pilot and are remote controlled. Four militants were killed on November 15, 2010, it is suspected that these were U.S drone strikes.Although Pakistan has denied air access they have said that the U.S to enhance intelligence capability on Pakistan soil. What interests me in this story is that the two military officials that have spoken to CNN in this article have asked that there names not to be stated because of sensitivity of the matter and they were not authorized to speak to the media. How Will We Finish What We Have Started??? Now that we have gotten in Afghanistan, how are we going to get out? The Government has decided to use NATO. Many people feel as if this is putting a lot on Obama's shoulders. To find out more you can click on the link for cnn.com, or you can watch the video below. Are the troops EVER going to leave Afghanistan? 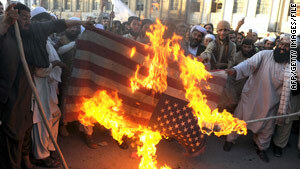 NATO members announced that they are planning to have troops in Afghanistan for a while. At 2014, they were going to leave control to the Afghans, but they are going to have troops in Afghanistan longer than that. The US is a part of NATO. People are saying that progress is being made in Afghanistan, which is a little reassuring. SS7H2 The student will analyze continuity and change in Southwest Asia (Middle East) leading to the 21st century. d. Explain U.S. presence and interest in Southwest Asia; include the Persian Gulf conflict and invasions of Afghanistan and Iraq. Iran designed an air defense system that has the same things as a Russian made system. Russia said in September that they were blocking weapons sales to Iran because of the U.N. Security Council that banned export of armored vehicles, military aircraft, helicopters and ships.